The sweet smell of home can mean many things to many people - but if, to you, it conjures the intoxicating aroma of warm dog food, rotten eggs or cannabis, you could be an inhabitant of one of the places mentioned below. We hold our noses and get set to explore England's pongiest places. Does your neighbourhood - to put it bluntly - niff a bit? Does your hometown - particularly during the summer - have a certain hum? When the wind changes direction, residents of several towns and cities get a waft of something very specific - be it biscuits or breweries. Image caption Does your hometown niff a bit? "Many of these smells are associated with industry," explains Will Rossiter, associate professor at Nottingham Business School, who points out that places like Newcastle-upon-Tyne and Burton upon Trent were once home to a "lovely, hoppy, malty smell" associated with their breweries. But in some places, the whiff was far more noxious. "It used to be the case that if you drove up the M1 through north Nottinghamshire, you really could almost taste the sulphurous smell of the old coking works," Mr Rossiter said. "You could see a yellow haze." As Britain's manufacturing sector has shrunk and environmental regulations have improved, Mr Rossiter says the smells associated with industrial processes have also disappeared - but there are a few places where industries - and their odours - continue to linger. So what do residents think of these heady aromas? Are they regarded with affection - do they smell like town spirit? Or are some townsfolk right to kick up a bit of a stink? Melton is famous for styling itself as the capital of rural food; both pork pies and Stilton cheese are made in the area. But it's another kind of food that infiltrates the nostrils of its residents. "During the summer there's a nice smell of warm dog food," said Sarah Haines, who lives in the town. The pet food smell that permeates the streets on sunny days stems from the Mars Petcare factory, on Mill Street, which manufactures rural fare of a different kind, namely Pedigree Chum and Whiskas. "It's just part and parcel of living here," added Georgie Kemp, Sarah's friend. "You certainly don't smell pie and cheese anyway, as you'd expect." According to social media, Melton also basks in the very distinctive odours of rural life - one of the drawbacks of being surrounded by rolling countryside. "Yes, you get the muck-spreading in the summer," added Ms Haines. "Basically, there are no nice smells." Image caption Sarah Haines and Georgie Kemp say their hometown smells of "warm dog food"
A local joke is that the town marks the point where the River Eye becomes the River Wreake - "Eye Wreake" being the result. But many residents say the odour does not offend them as much as you might expect. "Can't really say it bothers me," said one woman who was shopping at the town's market. "We stayed in France near a pet food factory and that one smelled much worse than ours," added another. Mars Petcare said it was aware its production processes occasionally produced "a distinctive smell" and it worked to minimise this as much as possible. Image caption Carlisle's biscuit smell is described as "a bit unusual"
In the battle of the Cumbrian pongs, the proud city of Carlisle definitely takes the biscuit. "One of the first conversations I had when I came here was with someone who said: 'It smells a lot better than Wigton'," said comedian Mark Steel, who visited Carlisle for his BBC radio series Mark Steel's In Town. He claimed Carlisle residents were so used to the "constant biscuit cloud" they could actually pick out the individual biscuits being baked at the time. "When I first came here I mentioned the smell to three people and every one of them went, "Yeah and it's ginger nuts today". It's a nice smell. It's just a bit unusual when it covers 15 square miles." Image caption Comedian Mark Steel referred to the scent as a "constant biscuit cloud"
"It's quite a comforting smell," said creative designer Lydia Leith, who lives in the city. "If they're making Nice biscuits, you get a smell of coconuts. Other days, it's a gingery kind of smell. "Although it's not very helpful if you're on a diet." Down the road in Wigton, however, townsfolk did not get quite so lucky with the whiff of their local industry. "It can only be described as sulphur," said Sandra Hodson, a town councillor who has lived here for 40 years. The so-called Wigton pong emanates from a nearby factory that makes food packaging film. The process involves a range of chemical processes which have been known to give off a rotten egg smell. "It's only on certain days and generally you smell it when you're going to get wet weather, for some reason," added Mrs Hodson. "It's like our weather station." However, she added the town was proud of the factory, which is owned by Japanese company Futamura. "It's the glue that holds us all together," she said. "If we ever lost it, it would devastate us." Futamura did not respond to the BBC's request for a comment. Image caption In the summer of 2018, the streets of Derby were plagued by a "mystery sick stench"
While some odours linger like - well, a bad smell - other whiffs disappear in a jiff. Such was the case for the people of Derby during the long, hot summer of 2018 when a mystery "sick" stench was reported in the city. 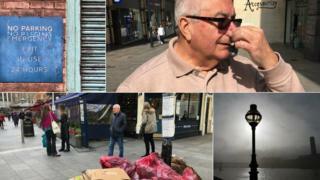 The smell was described by residents as "like sick", "like sewage" and "like poo" and one shop said it was "running dangerously low on air freshener". "It smells just like liquid manure," Tom Clarke, from Chellaston, told the Derby Telegraph. "It was just nasty," recalls Mycah Gatt, who lives in the city. "It smelled like pure sewage. It was so intense it made us feel dizzy. It was like shoving your head down a toilet. We stayed inside as much as possible." Derby Council and Severn Trent both said they did not know what caused the pong. Derby councillor Martin Repton speculated the stench stemmed from fertiliser from a farm in the Kedleston area. "We are a small city, quite low-lying, and, unlike other cities, we are surrounded by farms," he said. "I can remember smells like that as a boy at muck-spreading time but not quite as bad. "Perhaps it was the way the wind was blowing, perhaps it was a different type of fertiliser. "It was dreadful, it was obnoxious and the way it enveloped the streets was quite worrying." Image caption Martin Repton said the odour was "obnoxious"
Luckily, the smell quickly wafted over Derby and, so far, has yet to return. In July 2017 the residents of the Somerset town of Nailsea began complaining that their town smelled of cannabis. "Left my bedroom window open last night, woke up about three-ish with the room absolutely reeking of it," complained one resident on the town's Nailsea People Facebook page. Image caption Was respectable Nailsea the centre of a huge cannabis operation? "Is it just me or does Nailsea stink of weed?" asked another on Twitter. "Yes I noticed it the other day," somebody replied. "I did wonder if someone had been composting their cannabis plants!" Heather Pickstock was the Bristol Post journalist who sniffed out the source of the smell. "I first noticed it when I went into Nailsea one lunchtime and smelled it, initially thinking someone was smoking," she said. "It was quite pungent. But then I realised it was covering the whole town and started to investigate and saw other people talking about it on Facebook." What she found was quite surprising. "It was caused by the blackcurrant harvest by Thatchers Cider in Sandford for Ribena," she said. "They do harvest every year but it was the first time I'd ever smelled it." Thatchers said it pressed about 13,000 tonnes of blackcurrants at its mill in July and August each year. These are then sent to Ribena's plant in Coleford, in the Forest of Dean. The cider-maker added that the smell was a "perfectly natural" result of the pressing process. Police at the time confirmed the odour was "due to the annual blackcurrant harvest" and "not due to a large cannabis operation". "People do not need to be concerned," they added. Ribena, though, has declined to comment on the stink. Image caption London had "odour issues" in Victorian times, when it endured what was known as the "Great Stink"
In Victorian times, the English city with the biggest odour issues was London. Notoriously the city's "Great Stink", in 1858, saw the hot weather exacerbate the smell of untreated human waste and effluent around the Thames. The city cleaned up its act thanks to civil engineer Joseph Bazalgette's famous sewer system that still operates today. So has England's capital, in the words of a famous carpet reviver, managed to "put the freshness back"? "I think it's improved since Victorian times but some areas still smell a bit," said law student Hodan Shire, who lives in the north west of the city. "It smells mainly of cigarettes and traffic fumes," added her friend Zanaira Siddique, from Cambridge. "When you come here, it kind of hits you. When the weather gets hotter, it's even worse." Indeed, in October 2018 there were reports of an "acrid, noxious and strange chemical smell" across parts of the capital, although the authorities could not confirm the cause. "It smells of rubbish because of all the bins on the streets and the dirt and pollution," said Gemma Dilworth, who commutes to the city from Oxfordshire. "You have black bogeys when you blow your nose." "It's not really bad but there is still a smell," agreed her friend Annika Murfitt. Image caption Mark and Lynn Jones say the urine odour is "just a city smell"
"It smells of urine and drains," said Arsenal fan Mark Jones, from Devon, who was visiting the capital with his wife Lynn. "You can smell pee around every corner but, in fairness, that's just a city smell." Image caption Dane Lars Friis says the main thing he can smell is "lots of food"
However, to Danish national Lars Friis, who lives in Chiswick, the odour of London is a pleasant one. "Hmm... the main thing I can smell is lots of food."